CLASS FILLED! Please add your name to the waiting list. In just a few simple words, you can create something that will take a reader to a place from your experience, your memory, or your imagination. Capture moments that made you feel something, from nature or from people. This form has the effect of an artful photograph, except readers will make the picture themselves, and you will be able to include all the other senses as well as sight! While the starting point for this approach is from Japanese poetry tradition, we won’t limit ourselves to traditional subjects or worry about counting syllables too much. David Oates returns to lead this workshop with examples from his own and others’ work and exercises to help you get into the flow. 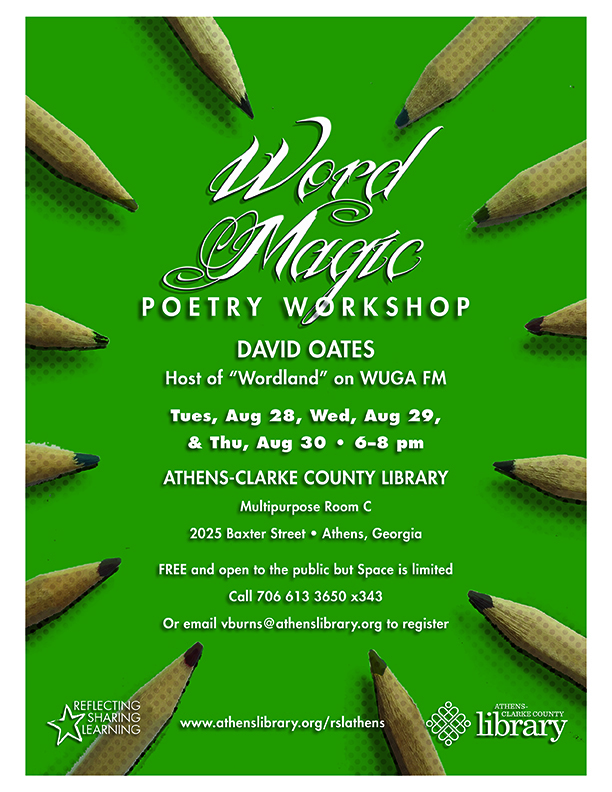 Mr. Oates has 30 years experience teaching writing, has had three books published, and his work has appeared in many magazines He is the host and producer of “Wordland” on WUGA FM. Oates received his master’s in creative writing from the University of Illinois—Chicago. The event is Sponsored by Reflecting, Sharing, Learning and is free and open to the public, however seating is limited so please call (706) 613-3650, extension 343, or email vburns@athenslibrary.org to register. The Athens-Clarke County Library is located at 2025 Baxter Street, Athens.